The automotive turbocharger market is expected to surpass the value of US$ 34 Bn by 2026, expanding at a CAGR of more than 5% during the forecast period. 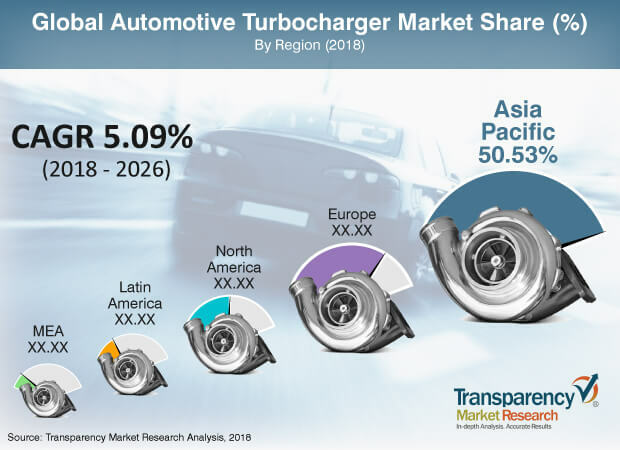 The market is expected to expand significantly during the forecast period owing to the rising penetration of automotive turbochargers in vehicles. The automotive turbocharger market is primarily driven by stringent emission norms across the globe. Rise in demand for vehicles with higher power output, coupled with stringent emission limits, has prompted manufacturers to install automotive turbochargers in their vehicles. Lower excise duty on smaller engines has compelled manufacturers to move toward engine downsizing, which can be achieved with the installation of turbochargers. On the other hand, adoption of turbocharger enables a smaller engine to deliver high power along with lower emission and higher fuel-economy, which is considered to be a key driver of the automotive turbocharger market. Engine downsizing also reduces the sprung mass on the vehicle, which enhances the fuel economy and performance of the vehicle. Automotive turbochargers are commonly utilized in diesel vehicles; however, the penetration of automotive turbochargers has risen significantly in gasoline vehicles in the last few years. Furthermore, the market for diesel vehicles is contracting due to higher exhaust emissions from diesel engines, as compared to that from gasoline engines. Therefore, the gasoline engine segment of the automotive turbocharger is anticipated to be more lucrative than the diesel engine segment during the forecast period. Production of diesel vehicles is anticipated to decline due to an expected ban on diesel vehicles in a few major cities that are experiencing high air pollution due to vehicle emissions, such as New Delhi, Frankfurt, Madrid, and Athens. Some regions such as North America, Latin America, and a few sub-regions of Asia Pacific have higher number of gasoline vehicles, which has contributed to the gasoline engine segment to hold a major share of the market. The gasoline engine segment is likely to expand at a significant pace during the forecast period. Rising investments and expansion of research and development centers for development of automotive turbochargers have led to the development of e-turbochargers, which are considered as the future of turbochargers for the automotive industry. The e-turbocharger was developed to overcome turbo lag that is experienced in conventional turbochargers by eliminating the dependency of compressor on exhaust of the engine. Penetration of e-turbochargers has been rising at a significant pace in the last few years. Previously, e-turbochargers were only utilized in premium vehicles; however, they are presently being employed in medium segment vehicles. Their penetration is expected to rise significantly during the forecast period due to several advantages they possess over conventional turbochargers, such as elimination of turbo-lag, lower heating of the engine chamber due to lower rpm of the turbine, improved engine efficiency, and comprises fewer components, which reduce the weight of the vehicle. The market for automotive turbochargers is anticipated to expand at a notable pace in regions with significantly higher penetration of gasoline engines, such as Latin America, owing to the increase in penetration of turbochargers in gasoline engines coupled with significant market share held by the gasoline engine segment in the global automotive turbocharger market. In terms of technology, the VGT/ VNT (Variable geometry turbochargers or variable nozzle turbochargers) segment is expected to hold a considerable share of the market due to its low boost threshold and efficiency at higher speeds. VGT/VNT turbochargers have been primarily developed for diesel engines owing to their higher capability to vary the effective aspect ratio of the engine from higher engine speed to lower engine speed, thus it enhanced the efficiency of diesel engines effectively and is currently penetrating gasoline vehicles owing to its higher efficiency over fixed geometry turbochargers. However, development in technology and better response and efficiency have enabled their adoption in gasoline engines and hence, the segment is expected to expand at a steady pace during the forecast period. Significant rise in the production and sales of luxury vehicles has boosted the twin turbo technology segment. Moreover, further rise in sales of luxury vehicles is expected to propel the twin turbo technology segment in the near future. Twin turbo technology is mostly utilized in V-engines, and it also multiplies the effect of turbocharging, which significantly boosts the performance of the vehicle. Furthermore, sales of luxury vehicles are expected to rise due to increase in purchasing power parity of society, primarily in developed countries such as the U.S., Canada, Germany, and Australia. Major players operating in the global automotive turbocharger market include Honeywell International Inc., IHI Corporation, MAHLE GmbH, Robert Bosch GmbH, BorgWarner Inc., Delphi Technologies, Cummins Inc., Eaton, Continental AG, Mitsubishi Heavy Industries Ltd., and Cardone Industries. Honeywell International Inc. is a leading manufacturer of automotive turbochargers in the global market and has been primarily focusing on product differentiation, manufacturing footprint optimization, and operational excellence in order to consolidate its position in the market. The company primarily focuses on emerging markets for turbochargers and competes in the market by structural cost leadership. The report contains value chain analysis, which provides a comprehensive view of the global automotive turbocharger market. The Porter’s Five Forces analysis of the market has also been included, which helps understand the competitive scenario of the market. The study encompasses market attractiveness analysis, wherein end-users are benchmarked based on their market size, growth rate, and attractiveness. The study provides a decisive view of the global automotive turbocharger market by segmenting it in terms of engine, operation, technology, vehicle, sales channel, and region. These segments have been analyzed based on present and future trends. Regional segmentation comprises current scenario along with forecast of the automotive turbocharger market. The forecast provided is based on the compilation of current trends as well as the expected scenario in future due to change in technological, geographical, political, regulatory, and economic factors such as the rapid expansion of the automotive industry. Stringent emission norms for each region have been considered while forecasting the market size of turbochargers. Rising demand for fuel-efficient vehicles and performance vehicles is considered in estimation of the automotive turbocharger market. The study includes profiles of major companies operating in the global automotive turbocharger market. The major share of the market is held by a few key players, and the rest is fragmented among medium-scale manufacturers. Major players operating in the market include Honeywell International Inc., IHI Corporation, MAHLE GmbH, Robert Bosch GmbH, BorgWarner Inc., Delphi Technologies, Cummins Inc., Eaton, Continental AG, Mitsubishi Heavy Industries Ltd., and Cardone Industries. Market players have been profiled in terms of attributes such as company overview, financial overview, business strategies, and recent developments. The automotive turbocharger market is primarily driven by the trend of engine downsizing among automotive manufacturers without compromising the power output of the vehicle. The report provides the estimated market size for 2017 and forecast for the next nine years. The global market size has been provided in terms of revenue (US$ Mn) and volume (million units). Market figures have been estimated based on engine, operation, technology, sales channel, vehicle, and region. Size and forecast for each major segment have been provided in terms of global and regional/country markets. Secondary research sources that are typically referred to include, but are not limited to company websites, annual reports, financial reports, broker reports, investor presentations, and SEC filings, internal and external proprietary databases, and relevant patent and regulatory databases, national government documents, statistical databases, market reports, news articles, press releases, and webcasts specific to companies operating in the market, Food and Hatchback Organization (FAO), Automotive Research Association of India, Factiva, etc.